Downton Abbey Returns with Season 4! You are here: Sewickley Public Library > Events & Programs > Recent News > News and Programs > Downton Abbey Returns with Season 4! We’ve waited for what seems like forever for Downton Abbey to return. Well, we wait no more! Downton Abbey returns on the evening of Sunday, January 5th! Join us in the Community Room at 2PM on the 5th for a recap of the end of season 3. We’ll serve tea sandwiches, scones, and of course ENGLISH TEA! In the meantime, check out some of these books and DVDs that will get you in the spirit! Behind the scenes at Downton Abbey By Emma Rowley – Gain unprecedented behind-the-scenes access to Downton Abbey in this official Season 4 tie-in book, complete with never-before-seen photos giving fans insight into the making of the runaway hit. Downton Tabby By Chris Kelly – Here, the aristocrats of the animal kingdom dwell in stately splendor, sleeping, grooming, sleeping some more, and being fed by their downstairs cats, unaware that their way of life—providing work for others—is about to be swept away by the tides of history . . . and runaway cars. This humorous parody provides essential information for preserving their Golden Age, including How to Keep a Secret at Downton Tabby, How to Argue with Lord Grimalkin About His Most Deeply Held Beliefs, and some Uninvited but Necessary Words from the Dowager. Lady Almina and the real Downton Abbey: the lost legacy of Highclere Castle By Fiona, Countess of Carnarvon – Lady Almina and the Real Downton Abbey tells the story behind Highclere Castle, the real-life inspiration and setting for Julian Fellowes’s Emmy Award-winning PBS show Downton Abbey, and the life of one of its most famous inhabitants, Lady Almina, the 5th Countess of Carnarvon. Drawing on a rich store of materials from the archives of Highclere Castle, including diaries, letters, and photographs, the current Lady Carnarvon has written a transporting story of this fabled home on the brink of war. Lady Catherine, the Earl, and the Real Downton Abbey By The Countess of Carnarvon – Lady Catherine, the Earl, and the Real Downton Abbey, a transporting companion piece to the New York Times bestseller Lady Almina and the Real Downton Abbey, tells the story of Catherine Wendell, the beautiful and spirited American woman who married Lady Almina’s son, the man who would become the 6th Earl of Carnarvon. The couple presided over Highclere Castle, the grand estate that serves as the setting for the hit PBS show. Following the First World War, many of the great houses of England faded as their owners fortunes declined in the new political and social world of the 1920s and 1930s. As war loomed, Highclere’s survival as the family home of the Carnarvons was again in the balance—as was peace between the nations of Europe. The Unofficial Downton Abbey Cookbook: From Lady Mary’s Crab Canapes to Mrs. Patmore’s Christmas Pudding – More Than 150 Recipes from Upstairs and Downstairs By Emily Ansara Baines – Bring Upstairs and Downstairs Fare to Your Table. Nibble on Sybil’s Ginger Nut Biscuits during tea. Treat yourself to Ethel’s Beloved Crepes Suzette. Feast on Mr. Bates’ Chicken and Mushroom Pie with a room full of guests. With this collection of delicacies inspired by Emmy Award-winning series Downton Abbey, you’ll feel as sophisticated and poised as the men and women of Downton when you prepare these upstairs and downstairs favorites. Downton Abbey Season 1 DVD OR BluRay – A stunning and colorful drama set around the aristocratic Crawley family and the staff which serves them. Set between 1912 and 1914, Downton Abbey chronicles the conflict of class, gender, and politics, and serves it up with a refreshing dollop of sizzle and scandal. Downton Abbey Season 2 DVD OR BluRay – Season two returns as the Great War rages across Europe, and not even the serene Yorkshire countryside is free from its effects. The men and women of Downton are doing their part both on the front lines and the home front, but the intensity of war only serves to inflame the more familiar passions of love, loss, blackmail, and betrayal. Downton Abbey Season 3 DVD OR BluRay – The War is over and a long-awaited engagement is on, but all is not tranquil at Downton Abbey as wrenching social changes, romantic intrigues, and personal crises grip the majestic English country estate for a third thrilling season. In the wake of World War I, Robert, Earl of Grantham, sticks to his duty to maintain Downton more firmly than ever. 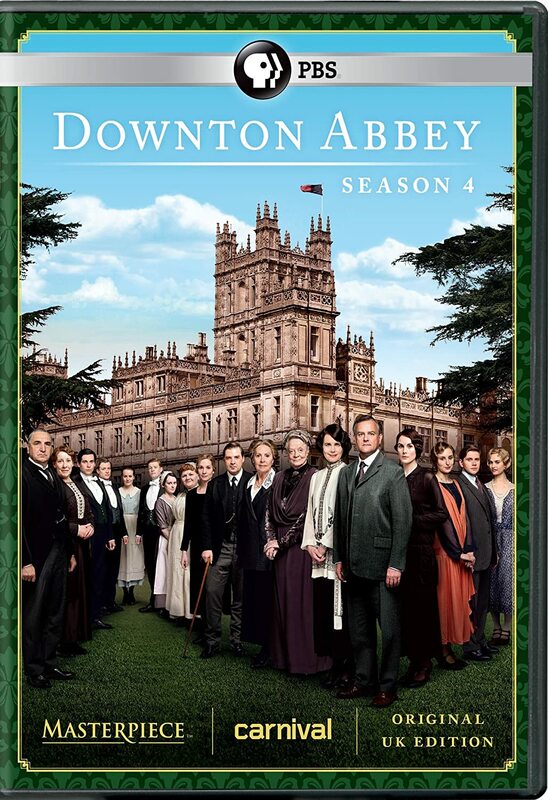 Downton Abbey Season 4 COMING 1/28 ON DVD & BluRay – The sweeping Downton Abbey saga continues with a fourth season of drama, romance, and family intrigue. Dame Maggie Smith stars as Violet, the stubborn Dowager Countess of Grantham, matriarch of Downton. Hugh Bonneville stars as her son, the stoic Lord Crawley; Elizabeth McGovern is his American wife, Cora, and Michelle Dockery is their daughter Lady Mary. From Academy Award-winner Julian Fellowes. Secrets of Highclere Castle – It may be more famous now than any time in its 1,300-year history as the setting of Downton Abbey, but England’s Highclere Castle has its own stories to tell. In its heyday, Highclere was the social epicenter of Edwardian England. See how all the inhabitants of Highclere lived, from the aristocrats above to the army of servants toiling ‘below stairs’. Also find out from the current inhabitants, Lord and Lady Carnarvon, what life in a fairytale castle is like today. Starting on January 31st we will be watching the DVD of season 4. Join us every Friday so you don’t fall behind.